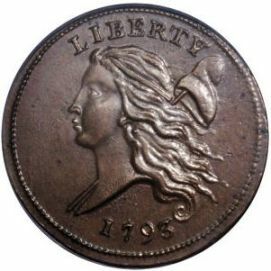 1793 Liberty Cap Half Cent - The first ever US coin to depict the liberty cap! Liberty Cap - A Symbol of Freedom! 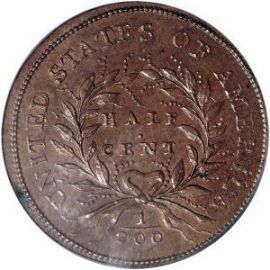 The 1793 half cent was the first ever US coin to depict the famed liberty cap as a symbol of freedom and pursuit of liberty in that era. The obverse of this coin shows liberty's head turned to the left. The reverse is that of a laurel wreath with the denomination at the base reading 1/200. This series is the smallest and thickest of all half cents minted for circulation. These pure copper coins measured about 22mm and weighed only 6.74 grams. HUNDRED FOR A DOLLAR. Another distinction that this coin has is that it has two leaves after the word DOLLAR on the edge of the coin.